LAS VEGAS (CelebrityAccess MediaWire) — The iconic song, All My Rowdy Friends Are Coming Over Tonight, sung by Hank Williams Jr. has been the theme of Monday Night Football since 1989 and was recently re-recorded with an all-star cast (Little Richard, ?uestlove, Joe Perry, Clarence Clemons, Rick Nielsen, Bootsy Collins, Charlie Daniels & Steven Van Zandt) when the sporting event transitioned to ESPN. Now Aerosmith is following suit. They are entering into a deal with NASCAR and ESPN to record a special live version of their hit song "Back In The Saddle" that will be an integral part of the network’s NASCAR telecasts in 2007. The taping will take place Saturday, Nov. 4 at the band’s concert at the MGM Grand in Las Vegas. "Other than being an astronaut, there are two things I can think of that can give you the same rush as sitting on a rocket: driving down the straightaway at Talladega at 200 miles an hour, and being the lead singer in Aerosmith," says Aerosmith front man Steven Tyler, "Aerosmith and NASCAR on ESPN and ABC couldn't be more appropriate." 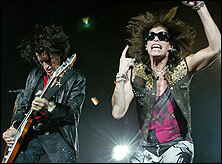 This isn't Aerosmith's first involvement with NASCAR. The band sponsored a car, #55 Chevrolet which was driven by Kenny Wallace in 1999. – CelebrityAccess Staff Writers.